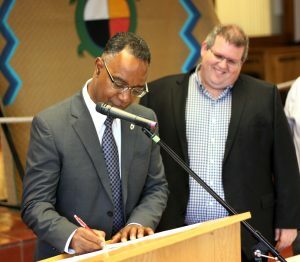 BU President Dr. Gervan Fearon (back row, at right) joined members of the BUAPC and political dignitaries to sign a memorandum of understanding to promote Aboriginal education, employment and business inclusion in Brandon. 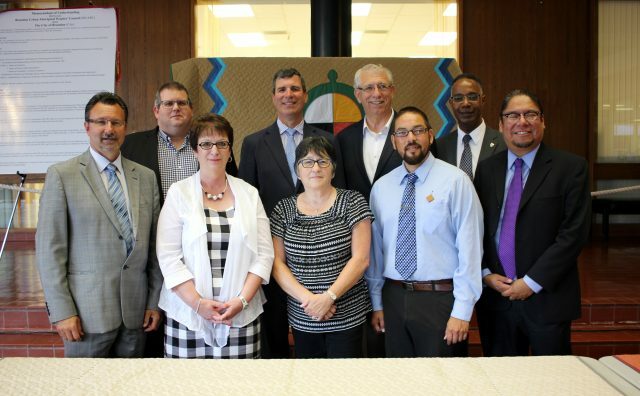 From left: Brandon mayor Rick Chrest, ACC President Mark Frison, Manitoba Minister of Indigenous and Municipal Relations Eileen Clarke, Brandon West MLA Reg Helwer, BUAPC Chairperson Leah LaPlante, Brandon-Souris MP Larry Maguire, BUAPC Aboriginal Community Coordinator Jason Gobeil, Dr. Fearon, and Dakota Ojibway Tribal Council's Maeengan Linklater. Brandon University (BU) reaffirmed its strong commitment to Aboriginal and Indigenous culture and heritage by participating in the signing of a Memorandum of Understanding between the Brandon Urban Aboriginal Peoples’ Council and the City of Brandon. BU is a founding partner of the BUAPC and was represented at the signing by BU President Gervan Fearon. BU President Dr. Gervan Fearon pens his signature to the MOU. Tom Brophy, Associate VP of Student Services and Enrollment Managment, and University Registrar, will be the new BU representative on BUAPC starting September 2016. The new MOU builds on a six-year-long relationship between the City of Brandon and the BUAPC, which was established in December of 2010 by the Brandon City Council to establish and foster an ongoing community conversation on matters of importance to Brandon’s Urban Aboriginal community. Since then, BUAPC’s diverse membership has brought community attention to the issues of aboriginal education, housing, healthy child development, economic development, employment, collaboration, and promoting a positive profile of Aboriginal people in the Brandon community. Now, with a signed Memorandum of Understanding in place between the two parties, solid goals have been set to develop and implement an Aboriginal Economic Strategic Plan to improve Aboriginal education, labour market participation, and the availability of business initiatives; and to establish longterm collaborative actions to address existing education and employment gaps. Gobeil noted that, as a number of community groups are represented within the composition of the Brandon Urban Aboriginal Peoples’ Council, a Commitment of Participation has also been signed by all BUAPC members to ensure their commitment to continue building on its successful initiatives to date. The MOU between the two parties will remain in effect until May 31st, 2018, at which time it is anticipated it will be renewed. The finalized MOU document will be posted on the Brandon Urban Aboriginal Peoples’ Council website (www.buapc.ca) in the coming days.